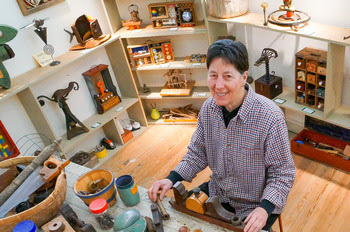 Dale Muir in her studio at Ashland Art Center, which she now shares with artist Denise Kester. Dale is known for her amazing assemblage pieces which give personality and expression to everyday found objects. Her pieces are part 3D collage and part sculpture. They celebrate the character of individual materials by bringing them together in a work of art that shows them in a new and beautiful light. Come see Dale’s fun and inspiring work in her studio upstairs. Live music will be performed by Rainy & the Rattlesnakes, a lively family bluegrass band.